SEATTLE (AP) — Gerrit Cole struck out 11 in six innings, Aledmys Diaz homered and the Houston Astros completed a three-game sweep of the Seattle Mariners with a 3-2 victory Sunday. Cole (1-2) gave up two runs on four hits, including a leadoff home run to Mitch Haniger, and did not walk a batter. Cole has pitched at least six innings in each of his four starts. Haniger’s homer, his fifth, extended the Mariners’ major league record streak of 18 games with a home run to start the season. Haniger also doubled and scored both Seattle runs. Cole and the Astros bullpen shut down the Mariners, who entered leading the majors with 7.29 runs a game. After Domingo Santana hit a run-scoring double in the third for Seattle’s second run, no other Mariners hitters reached base, with Houston retiring the last 19 Seattle batters. Hector Rondon, Ryan Pressly and Roberto Osuna each pitched a perfect inning in relief for Houston, with Osuna working the ninth for his seventh save. There were some close calls for Osuna. Haniger appeared to start the ninth inning with an infield single, but was ruled out on replay. Santana had fans on their feet with a long drive down the right field line that went foul before striking out, and Daniel Vogelbach worked a full count before striking out looking to end the game. Mariners starter Marco Gonzalez was trying for his fifth straight win to open the season, and looked on track early. Gonzalez allowed just one hit over the first five innings as Seattle opened a 2-0 lead. The Astros took over in the sixth. Singles by Tony Kemp, Jose Altuve and Alex Bregman loaded the bases. Michael Brantley then drove in two runs with another single, trying the game and ending Gonzalez’s day. Brandon Brennan struck out the next two batters to end the inning. In the seventh, Diaz led off with his second homer, the first run Brennan (1-1) allowed after starting the season with 11 1/3 scoreless innings. Mariners: Placed starting LHP Wade LeBlanc on the 10-day injured list with a Grade 2 right oblique strain. LeBlanc is expected to be out four to six weeks. Seattle recalled RHP Erik Swanson from Triple-A Tacoma on Sunday. Swanson is expected to take LeBlanc’s upcoming spot in the rotation on Wednesday against Cleveland. The Mariners traded C David Freitas to the Milwaukee Brewers for minor league RHP Sal Biasi. 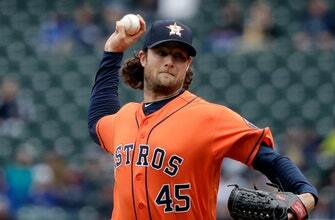 Astros: RHP Colin McHugh (2-1, 2.65 ERA) makes his fourth start at Oakland on Tuesday. McHugh has one win against the Athletics this season, after his pitched six one-run innings on April 5. Mariners: LHP Yusei Kikuchi (0-0, 4.15) is looking for his first major league decision in his fifth start as Seattle starts a three-game home series against Cleveland.